Two chance encounters that same day and almost within an hour put an entirely different complexion on the case to Roger’s eyes, and translated at last his interest in it from the academic into the personal. The first was in Bond St. Emerging from his hat-shop, the new hat at just the right angle on his head, he saw bearing down on him Mrs Verreker-le-Mesurer. 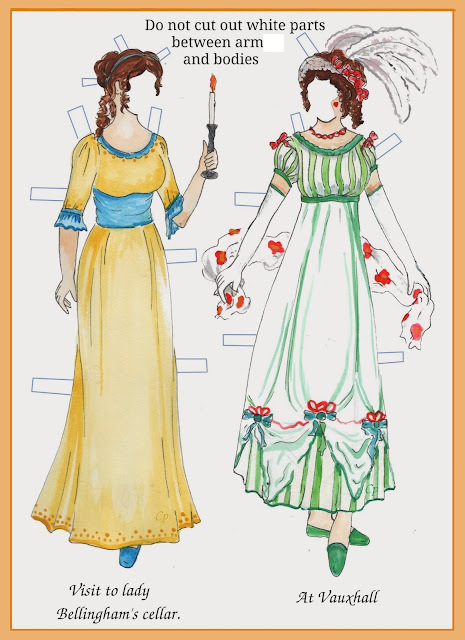 Mrs Verreker-le-Mesurer was small, exquisite, rich, comparatively young, and a widow… But she talked. She talked, in short, and talked, and talked. And Roger, who rather liked talking himself, could not bear it. It is a very clever story: six criminologists agree that each will look at the same current murder case, and come up with their own conclusions, to be shared with the others on successive evenings. 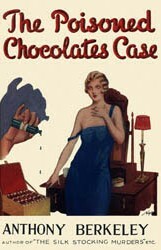 The case involves those chocolates, which reach an unlikely target and kill her. So who sent the chocs, and who was the intended victim? There isn’t a huge cast, nor a huge range of clues, but Berkeley manages to produce six quite different narratives based on the same facts, and they are very entertaining. I find the concept a bit tiresome, but the author certainly did well in keeping the interest and tension up. In the end, the endless speculation on the people involved meant they had no depth, because their morality changed with every chapter. But tour de force is still the right description: what an achievement. A handful of authors appear throughout Martin’s book as he follows their life and work in depth (other lesser figures make briefer appearances), and of these Berkeley was the one I knew least about. His was a fascinating and, towards the end, rather sad story, and he had an unexpected and to me hitherto completely unknown connection with one of my favourite non-crime authors: EM Delafield. (Her Diary of a Provincial Lady has featured many times on the blog - it shares the honour of being the book-with-the-most-posts with James Joyce's Ulysses.) Martin does a skilful and sympathetic job of trying to untangle the ins and outs of Berkeley’s rather raffish life. I was glad to be reminded of this book and to re-read it: I will now be looking on my shelves to see which others of his I have. And I would recommend again the Martin Edwards book - see blog review here, and Martin's own intro to it here. 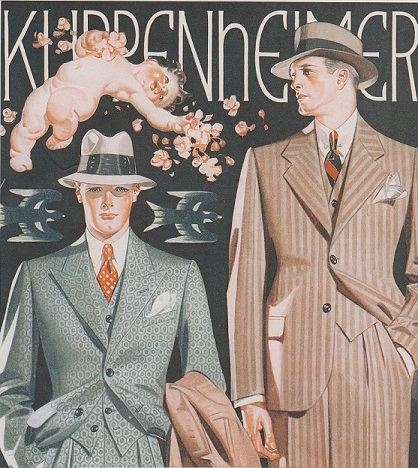 The top picture is a 1929 hat advert – two choices as to which is the correct angle. I can see you are going to rely on that monkey too much - there are going to be co-dependency issues you know. Yes, Margot, how terrible is it if you are reading about the deadly chocs, and wondering if the non-poisoned ones were actually nice or not? Distraction. I read this in 2012 as it's #41 in the CWA's top 100 list, and I have to admit I wasn't that impressed. I liked the set-up, but I agree the constant reinterpretation of events by six different sleuths got tiresome. Clever idea, and cleverly executed, though. I think Berkeley was really hipped on the idea of undermining "truth" in the detective novel. So often his detective Roger Sheringham gets things wrong. I'm not as big a fan of Berkeley/Iles as Martin is, but I was glad to see Martin praise Berkeley's orthodox village mystery Not to be Taken--I think it's underrated relative to his best-known books. I'll have to look out for that one Curt. I do like the Iles books better, they have more depth I think. Moira; Mr. Suave is on the right. My wife has bought some hats this year. She tells me they are becoming more popular. I certainly see more in stores. For men, I have never worn a formal hat. Our younger son enjoys hats. When he was 20 in 2005 and in New York he looked up a vintage store so he could buy a fedora. Thanks Bill, I needed an expert to tell me which was better. I quite miss hats myself, as I have said before, and I do like them on men. But I think that may be a lost cause, despite brave holdouts like your son. It would be nice to think that proper hats for men were making a comeback. I need something to keep my head warm, and baseball caps just make me look silly. I read quite a bit of Berkeley a few years back, including this book. The early ones are great fun, but theres an increasing strain of misanthropy in the later books that makes them hard going. He's one of those writers that you end up admiring rather than liking. I'm glad to hear that there are more fans of men's hats out there. They did serve a useful purpose after all. I like the fact that if you look at old photos of sports events you find a sea of men's hats. I think that is exactly what I think about Berkeley. I will re-read some more though. Haven't read the book, though it sounds intriguing - but I love that picture! I wish men dressed like that these days... suit (with a handkerchief in the breast pocket of the jacket; waistcoat; crisp, ironed shirt; tie nicely knotted; hat... and I bet they were wearing nicely polished lace-up shoes,,, I think it's a wonderful look. Delighted I tempted you to read this one! I agree with the remarks about Berkeley's personality. He was a very difficult chap, and though I think there were some extenuating circumstances, he often behaved badly. But although not all his books are masterpieces, his best display both intelligence and wit, qualities I admire. I vote for hats too. The fact that my hairline began receding after 45 has nothing to do with it either--really! Concerning Berkeley/Iles, it's rather remarkable that neither the PD James or Lucy Worsley books mentioned him! Martin is a great fan, like Julian Symons was, though Symons really only discussed three books by him in any detail in Bloody Murder. He's certainly very important to the GA, perhaps as much as his advocacy as in his works themselves. Yes, very much the forgotten character there. I must get Bloody Murder out again - I used to consult it a lot, but I haven't looked at it for ages. I have read about this book in various places, and I guess it is the premise that doesn't appeal to me. I think I will probably read it someday anyway. And to my knowledge I have read none of this author's books, under either name, which really surprises me. I'm sure something by him will turn up at the book sale one of these years Tracy. I think Malice Aforethought, under the name Francis Iles, is the best of his. I thought I had picked up Malice Aforethought at a recent book sale, but I don't find it in my catalog of books. It may be in the box of stuff I have not cataloged yet. Someday, as you say. And I love that top image.